Good, high-end stock trading software will assist you to NOT rely on hunches, guesses, fear or greed. 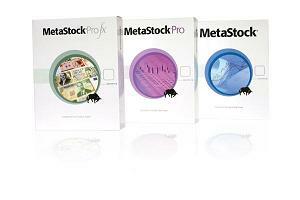 In my opinion, MetaStock is the best technical stock trading software on the planet. It is the winner of the Best Technical Analysis Software award for 17 straight years. MetaStock helps you become a more successful trader by improving your odds over all. It also helps take the guess work out of trading by offering a methodical, systematic approach. MetaStock also provides a Fundamental Analyzer, which gives you a comprehensive, organized library of fundamental data on individual stocks. You can even scan the market based upon fundamental criteria that you choose, then take the customized results and do technical analysis in MetaStock. This is one of the MOST important tools, that will help you become a confident and profitable stock trader. The Nison Candle Scanner. is a “push-button” easy way to identify your favorite candlestick charts patterns. This stock trading software is so remarkably easy to use. You don’t need to know how to program a computer. You don’t need to write any formula code. You don’t even need to know how to tell the difference between a “hammer” and a “doji. You just pick the pattern you want from a list and – in real time – you’ll see ALL the markets that meet Steve's criteria for that pattern pop-up right on your computer screen! Steve has hand-picked the very best candlestick patterns and created the filters to sift through thousands of markets for you in record time. All of the filtering and analysis that Nison Candle Scanner™ performs for you is done instantaneously over the Internet using proprietary filtering technology that alerts you to candlestick patterns in real-time. You can filter all daily or longer term markets (plus intraday for alerts), all the time, and have only those meeting pre-specified criteria instantly be called to your attention. Nison Candle Scanner is available as an instant download. Nothing will be shipped to you, which means no waiting for the delivery man! Try Nison Candle Scanner absolutely RISK FREE for a full 10 Days... and if you don't agree that it's everything you've promised... you can return it for a prompt, friendly refund. Return from "Technical Stock-Trading Software" to the Home Page: "Stock Market For Beginners"